Rich Butler reenacts the style of Elvis Presley through voice, music, movement and charisma performing songs from the 50's through the 70's. Mr. Butler performs throughout the Southeast but concentrates his efforts in his home of Huntsville. 30th birthday party for a young lady who adores Elvis! Rich was wonderful! His interaction with the guests made everyone feel special, especially the guest of honor. 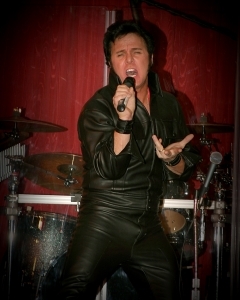 His ability to pay tribute to Elvis through not only the songs he sang, but his performance of them was spectacular. I would highly recommend Rich and will call him again! Rich made our event special! We really appreciated how accommodating and professional Rich was. He was great to work with, and his performances were awesome. He looked and sounded like Elvis, and he made sure to pay special attention to the guest of honor, which made the night even more special for my grandmother. Thank you, Jaclyn. Your group was fun, engaging and threw the energy right back to me! I appreciate the opportunity to have performed for your special event. Rich really engaged our crowd. He is amazingly talented! We felt like Elvis was really there! Highly recommended for your event! What a great group - my first gig in a man cave! I had a great time, the Gray's have wonderful friends and positive energy, and they threw the energy back at me ! This performer turned a special birthday into the best birthday party ever! We felt as if we were on stage at a Las Vegas show. Could not have been happier with the music his energy and his charming way with the ladies. We did not want him to leave!! Thank you, Brook, it was a pleasure performing for you! Best holiday fun you can have! The Blue Suede King was over the top again this year. He came to entertain my family and friends for a nice 45 minute concert. The entertainment is fantastic, his voice is incredible, and his personal service is outstanding! He sang "Love me Tender" to my sister and she loved it. Everyone danced and he took requests. All in all it was perfect! Great job really enhanced the party! He was very easy to work with. Came early, mingled with the people and then did a great performance that was enjoyed by all. Thanks, Lin. It was a pleasure to perform for your party! I really enjoyed your group and had a great time myself! We hired blue suede king for my mom's 60th surprise birthday party. She loved it! He was very charismatic and energetic. He brought props to get people involved in the show. We didn't have a large group but he still gave us a full show. Very impressed! Thank you, Amber. Your mom was great - I thoroughly enjoyed your whole family! Thank you for the kind words. It was a pleasure to perform for your family. Rich did a great job! Very talented and very personable. Highly recommend him! 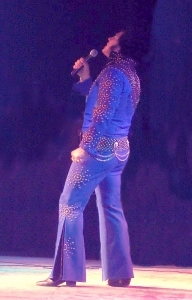 The Blue Suede King was certainly the highlight of a spectacular party. We had a wonderful dinner with the crescendo being the surprise visit of Elvis before dessert. Everyone danced sang and had a ball with the excellent music and the fantastic showmanship of the King! Thank you for making a wonderful holiday for friends and family! Thank you, Cindy, for your kind words. It was a total pleasure to perform for you and your friends! Rich Butler reenacts the style of Elvis Presley through voice, music, movement and charisma performing songs from the 50's through the 70's. Mr. Butler performs throughout the US. Fortune 500 companies, local businesses and casinos regularly utilize his talents. Rich also graciously contributes his time and talents to perform for numerous charitable organizations. 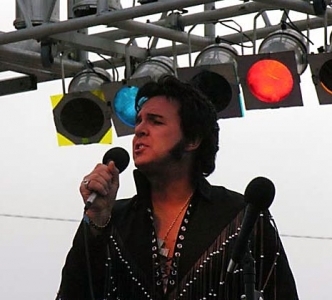 In 2002, Rich had the honor of performing at the Elvis Extravaganza in Laughlin with the legendary Jordanaires. 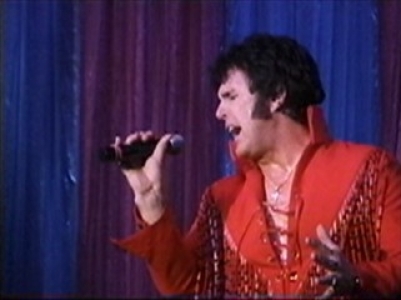 In 2003, he celebrated Elvis' birthday by performing on the television show Good Morning Tucson on ABC. 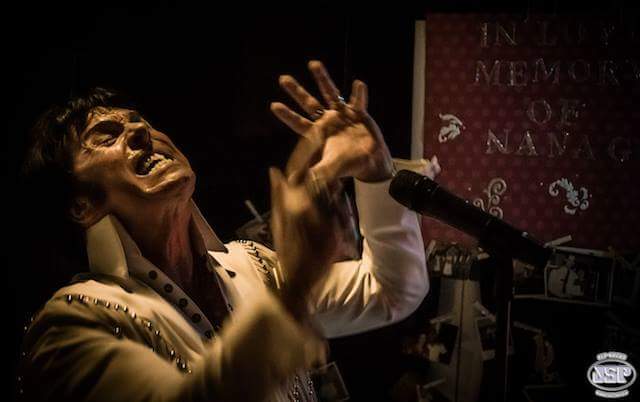 He appears in the documentary based on Elvis impersonators entitled "Almost Elvis" and is listed in the publication, Elvis and You. I saw Elvis in 1957, and you guys are as Good or Better than Elvis was back then!